Repetitiveness and discipline are the secrets of cake decorating. The art comes from the meticulous technique, the way it does for a dancer. I laughed the entire time I was making this cake. Laughed at myself. So I had this vision in my head that I wanted to execute– a small, mini, tall cake with clean layers, and naked frosting. 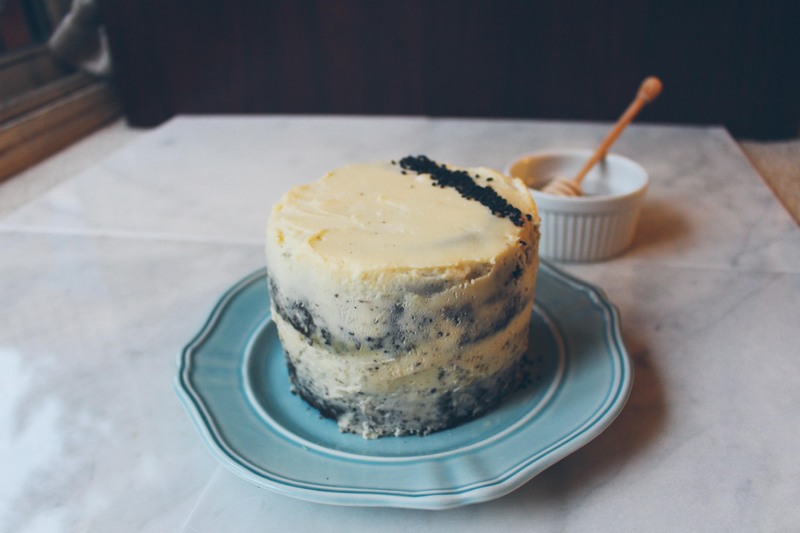 Because for the longest time, I’ve just been in love with the many naked cakes of the world. There’s less frosting (usually overly sweet, and just a nuisance), you have more layers in between your cake layers and show those off, plus it lends itself better to floral decorations, or just minimal decorating. 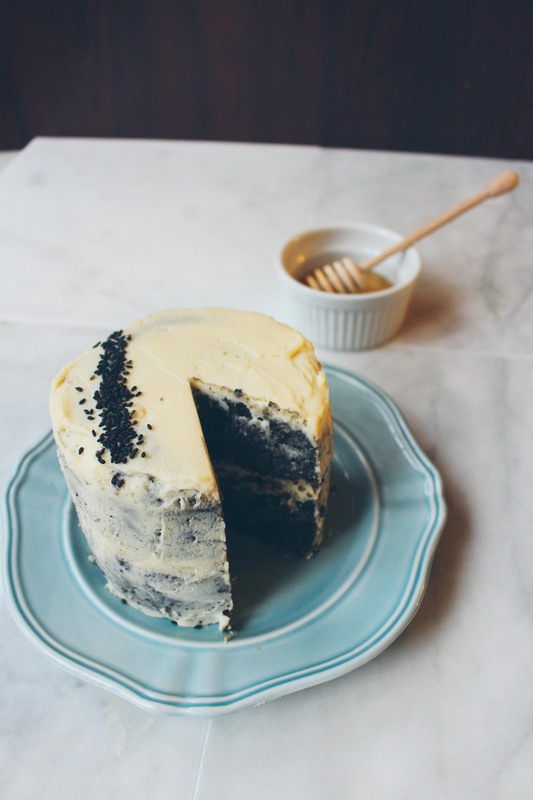 And I wanted to do it with black sesame, black tahini, and banana, with as little sugar/fat as I can get away with. For a higher flavour and nutritional payoff. Stir, stir, stir. Oh, the batter seems a bit too wet. That’s okay, I’ll just bake it a little longer. (Note: I have an irrational fear of over mixing, and over baking). Take it out of the oven– first thing I notice, the 2 cakes are of uneven height. That’s okay, I’ll just trim the taller one once they’re cooled. I busy myself for a few hours, and now it’s slightly past midnight. I prefer to bake at night, and shoot the next morning. This can only happen on non-busy weekends. I usually don’t get a chance to shoot with natural light on a weekday– I’m up before it’s bright, and back as the sky is dimming. The cakes have cooled, and I whip out my KitchenAid mixer to beat together my mascarpone frosting. Dad: “you know, if we lived in an apartment, you wouldn’t be able to do this”. I’m a total carbivore. When my family goes out for dim sum, our must order items are the usual ones– har gow, sew mai, beef cheung fun, egg tarts. We’ve had our fair share of super soft, melt-in-your mouth baked (not steamed) BBQ buns. Soft enough for me to examine its texture and wonder how it was achieved. These rolls were made in pursuit of that melt-in-your mouth quality. I started off with the hokkaido milk recipe buns, but made a few notable changes to both the ingredients and method. And guys. The results were brilliant.